In a context of economic slowdown in the Andean Region, a structural and transformative fiscal reform agenda is needed to achieve a new model of sustainable development centered on equality, environmental sustainability and the realization of human rights. This is one of the conclusions of a new report published by the Center for Economic and Social Rights (CESR) following a series of dialogues as part of a mapping exercise on the relationship between fiscal policy, inequality and human rights in the region. 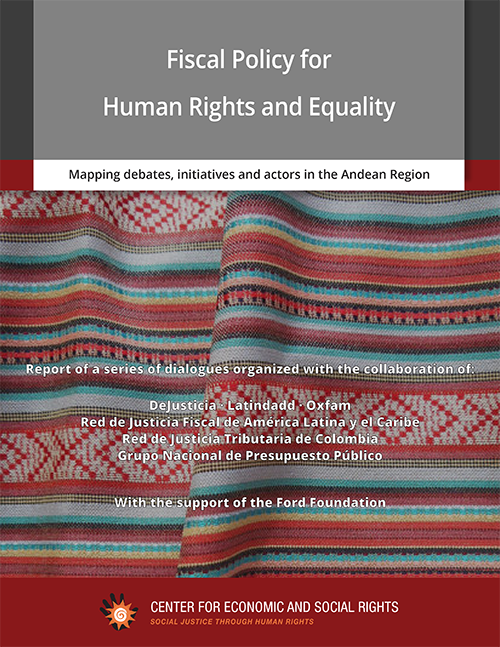 The report, Fiscal Policy for Human Rights and Equality: Mapping debates, initiatives and actors in the Andean Region, (English summary here) stresses that such a transformation will only be possible if civil society organizations and social movements are able to participate effectively in shaping fiscal policies and determining how revenues from natural resource exploitation are managed and distributed. It argues that human rights provide a unifying discourse and an accountability framework for advancing fiscal justice for women, indigenous and afrodescendant communities, whose voices and interests have been traditionally excluded from fiscal policy debates. Taking stock of the field of advocacy on fiscal justice, inequality and human rights is an essential first step in fostering alliances and identifying common goals across the variety of actors involved in fiscal policy debates in the region. To this end, CESR together with six regional and national partners – DeJusticia, Red de Justicia Tributaria de América Latina y el Caribe, Latindadd, Red de Justicia Fiscal from Colombia, Oxfam International and Grupo Nacional Sobre Presupuesto Público in Peru- engaged in a rich and participatory mapping exercise, carried out with the support of the Ford Foundation’s Andean Region Office. This was geared towards examining the state of debates on fiscal reform in the Andean countries and the initiatives and strategies being implemented by civil society actors, including social movements. Based on the input provided by more than 50 organizations and experts, the outcome report offers a road map for civil society action seeking to achieve progressive and structural fiscal reforms. Natural resources have been deemed a curse for developing countries. There is consensus, however, that the impact of natural resource exploitation on a country’s economy and development is dependent upon the quality of its institutional governance, among other factors. Sound governance includes managing the fiscal challenges stemming from the exploitation of natural resources. While abundant economic literature exists examining fiscal rules, principles and strategies to strengthen the management of these revenues, attention to the role of fiscal policy and taxation in achieving sustainable development, reducing socio-economic inequality and fulfilling human rights in resource-rich countries has been paid much less attention. In the Andean Region, the natural resource boom over the past 15 years has not translated into long term economic development nor has it served to reduce poverty or income inequality to the extent expected, as the UN Economic Commission for Latin America and the Caribbean (ECLAC) has shown. Furthermore, according to the most recent data on economic trends, while tax revenue slightly increased in Latin America in 2016, it substantially decreased in the Andean Region due to its great dependence on extractive industries and the steady decline in the price of commodities. To make headway in combating inequality and poverty in line with their recent commitments under 2030 Agenda for Sustainable Development, natural resource-rich countries must bring about a paradigmatic shift in the way they generate and mobilize resources. In this context, linking fiscal policy and human rights was felt by regional dialogue participants to be urgent and timely. As the mapping report highlights, there is a renewed energy among civil society actors in the region to confront the fiscal policy orthodoxies which have perpetuated exclusion, and to deploy new tools and approaches in the pursuit of an alternative fiscal paradigm based on principles of human rights, equality and accountability. The implementation of austerity programs and budget cuts on social programs as means to reduce fiscal deficits has been widely rejected by civil society actors as profuse evidence exists that these measures have not served economic recovery objectives but have exacerbated unemployment, poverty and inequality. Overall, the report reflects an overwhelming consensus among tax justice, human rights and development actors, as well as among women's, indigenous and afro-descendent movements, that unjust fiscal policies account for the alarming disparities (socio-economic, gender, racial, ethnic, political and other) which persist in the region, and that governments have not done enough to include them in decision-making regarding the destiny and sustainability of revenues from natural resource exploitation. The report also points to an emerging community of practice working across disciplines and movements to overcome common institutional and political obstacles, such as elite capture, corruption and a complex political economy that hampers the effective participation of the largest and most disadvantaged segments of society in fiscal policy reforms. These silo-busting initiatives and collaborative platforms should be sustained and supported. The Andean Region is at a crossroads where it must choose between adopting fiscal reforms aimed at achieving a new model of sustainable development centered on human rights, equality and environmental sustainability, or turning its back to follow the austerity path marked by other countries in the region such as Brazil. The 2030 Agenda and debates over the reform of global tax governance provide external opportunities and incentives for governments in the region to avoid the natural resource curse and to contribute to a shift in regional and global fiscal policy-making. CESR will continue to work alongside its allies in the region to make sure human rights are at the center of a transformative civil society agenda for equality and fiscal justice.